There are certain moments in your life that are worth replaying. You know the ones I mean, the moments that make you smile and remind you about all that was good in your youth. I have one particular moment that I’ve always returned to over the years, one that made me feel like a million bucks. The fraternity was hosting another Friday night “celebration”, and I was going to meet him in the basement of the frat house before the “guests” all arrived. I had taken particular care getting ready that night, and was wearing a pair of heels I would KILL to be able to wear today. I walked down the stairs and smiled as I heard the loud voices of the brothers laughing and carrying on. I got to the bottom and saw Nick behind the bar. He was holding a cold beverage in his hand as he turned to look my way. His blue eyes widened and an incredible smile stretched across his face. He threw his full beverage over his shoulder, reached for me and bent me over for a kiss. We’ve corresponded a bit over the last year or so- sharing friendly inquiries and some funny stories. Then I received an email from him Sunday morning saying that he would be in Smithfield Oregon THAT DAY to attend a basketball game with friends. Would I be able to stop by the university to say hi? I knew that he was in a great, serious relationship with someone, and I am embarking on a lovely relationship with Mr. Darcy. This meeting was going to be one between old friends who hadn’t seen each other in thirty years. There were no hopes, illusions or crazy expectations for anything other than a friendly meeting. But there were a few butterflies. I drove away smiling as I thought of our days of youth…and wished I had thanked him for that very precious memory I carry around. The one I take out every now and then when I need to be reminded of the beautiful, joyful, carefree days. 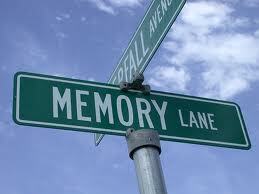 And lately, on these crazy days while I am still fighting for my life, I need those memories. They are keeping me warm. This post made me cry...and remember. Sending you lots and lots of hugs. And eventually, box tops. (I have realized, that not having a "child" in the house means that box tops aren't as abundant as they used to be). Love this - I have one of those stories myself, and when I think back it makes me smile every time. I love being able to pull memories out like this and relive those special moments. Sending you love, VM. Love that memory!! I completely understand how lovely it is. I have one like it...only I was 43 and feeling like I was getting old (ha now I would love to be 43 again lol). In the door or our business walked my old high school boyfriend who I hadn't seen since then. I ogled him, still yummy, only mature now, finally I got up courage and walked towards him saying, Hey Jay! He glanced my way, did a double take, walked fast over to me, said, OMG you're f-ing gorgeous! and lifted me off the ground in a huge hug. Oh yeah I have dined on that one for years! An old beau told me I was f-ing gorgeous when I felt less than attractive. What a boost that stuff is. what a sweet memory to have!! Loved this story! Were you wearing your Omegas jacket with those heels--? This post brought me back to forks in the road, decisions made, some good and some not so good. It's funny I read some of the comments and i too went back to that basement frat party the carefree wild days it made me smile to think of those memories I've tucked away for many many years. I'm happy you went and still have that memory to get you through the tough times. Chin up girl you are on the road to being good again. Loved this post. Even though we're a few years apart, that basement is part of a lot of my great memories too.